Thales has achieved delivery of the first of three maritime surveillance aircraft under the Meltem II programme for Turkey. This aircraft will be operated by the Turkish Coast Guard from Izmir Air Base. Pierre Eric Pommellet, Senior Vice-President of Thales Group, officially handed over the aircraft at a ceremony held at the Turkish Aerospace Industry (TAI) facility in Ankara. The official hand-over was presided by Turkish Minister of Interior, Mr Idris Naim Sahin, who thanked all contributors to the programme and its main contractor Thales for “delivering a state-of-the-art aircraft which will enable the Turkish Coast Guards to perform their surveillance duty up to 120 miles from the coast”. Designed around a latest-generation integrated tactical command system, the AMASCOS solution ties together multiple sensors – radar, FLIR, ESM, acoustic system, AIS, MAD, SLAR radar, IR/UV scanner – to detect, identify and track threats, maintain real-time tactical situation awareness, manage NATO and national tactical datalinks and deploy onboard weapon systems. The ceremony was also attended by the Undersecretary for Defence Industries (SSM), the Turkish Coast Guards Chief Admiral, and the Turkish Coast Guard Izmir Air-base Commander. The French Ambassador to Turkey also attended the ceremony with a representative of the French defence procurement agency (DGA), as well as the General Managers of TAI, Havelsan, Aselsan and Milsoft, the Turkish companies involved in the programme. This marks the delivery of the first maritime surveillance aircraft equipped with the Thales AMASCOS mission system, which will provide the Turkish Coast Guards with an enhanced capability to better monitor the Turkish Exclusive Economic Zone and Territorial Waters. » Search and rescue operations. 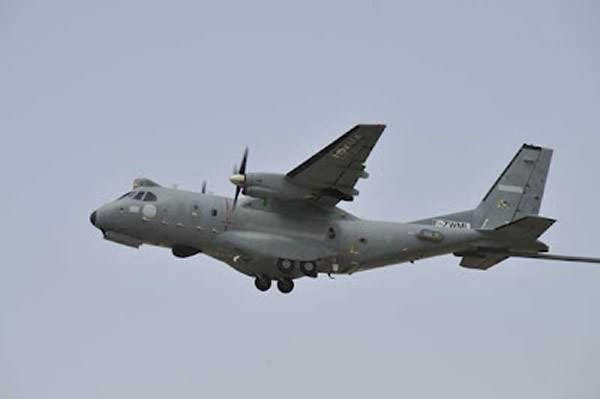 Thales is the prime contractor for the Meltem II programme, which calls for the delivery of six maritime patrol aircraft for the Turkish Navy and three maritime surveillance aircraft for the Turkish Coast Guard, all based on modified CASA CN-235 platforms. The programme also includes the provision of additional maritime patrol systems to the Turkish Navy, to be integrated on ATR 72 aircraft. All mission systems are based on Thales's AMASCOS solution (Airborne Maritime Situation & Control System). This success marks a new major milestone in the Meltem II programme, and follows the delivery of four maritime patrol aircraft (initial standard) to the Turkish Navy during the first semester of 2012. This is further testament to the maturity of the AMASCOS solution and further consolidates Thales's market leadership in maritime surveillance and patrol systems. The programme represents the latest validation of Thales’s position as a world-class systems supplier and integrator offering a broad spectrum of mission critical systems, able to meet specific requirements of both armed forces and civilian protection agencies from across the world.